Many of you know my long-standing interest and experience in Latin America, going back to when I began my CIA career in Santiago, Chile in the 1970s. I had the good fortune of heading the Latin America Division at CIA and working in many countries in Latin America, including Venezuela. It is with that history in mind that I watch the political-economic crisis unfolding in Venezuela and the current struggle between the Venezuelan opposition leader, Juan Guaidó, and the authoritarian government of Nicolás Maduro. The struggle is familiar, but it is also an example of the rising levels of political violence and crime throughout Latin America that are affecting many of our clients as they seek to do business in the region. A combination of poor economic policies, corruption, and a wholesale degradation of democratic institutions has led to the crisis in Venezuela. Venezuela has been in a death spiral of violent political protests and economic collapse over the last few years, as Venezuelans have taken to the streets against Nicolás Maduro and 3 million have fled for the borders to Colombia and Brazil. While the Venezuelan government has been unable and unwilling to rescue the country from devastation, ordinary Venezuelans suffer from soaring crime rates, rampant corruption, and endless lines to procure basic goods and services which are in short supply. It is unclear whether Juan Guaidó has the capacity to lead Venezuela out of crisis and usher in a transition back to democratic rule with new elections, but it is clear Venezuela will not emerge from the violent chaos and turmoil until there is a change in government. Mexico and Brazil are not Venezuela, but these countries also suffer from increasing levels of political violence and criminality. Mexico’s homicide rate was the highest on record in 2018, as political violence increased sharply ahead of the July 1, 2018 election, which saw leftist nationalist Andrés Manuel López Obrador win the presidency with 53 percent of the vote. Indeed, López Obrador’s win could be attributed to the growing insecurity and violence in the nation, and a growing weariness of the population to tolerate it. As in Mexico, it is the organized criminal groups, gangs, and drug trade that fuel the violent crime in Brazil too. Increasing levels of violence and insecurity also played a role in Brazil’s 2018 presidential election, and right-wing Jair Bolsanaro won 55 percent of the vote after campaigning on an authoritarian agenda against crime and corruption. Their leaders may be ideologically opposed, but both countries will have to address the issues of impunity and corruption while also going after the gangs, organized criminal groups, and drug cartels behind the violence. Despite the high levels of political violence and crime in Latin America, businesses can and do manage the risks that come with the operating environment. Corporate entities operating and investing in Latin America require ongoing risk management. Successful companies in the region invest in appropriate systems and protocols so they can mitigate the risks and seize the opportunities. They also turn to specialized firms, like The Arkin Group, that can help them navigate the security concerns and prepare for possible downside impacts as a result of the security situation – including anything from violent political protests disrupting supply chains to CEO and top management being targeted for kidnapping and extortion to criminal groups penetrating the organization for illegal gain. Political solutions and policy changes will not happen overnight, so businesses need to manage the risks while also taking advantage of the economic opportunities that Latin America presents. To give a more detailed explanation for the rising levels of political violence and crime in Latin America and how to safeguard your business in the region, I have co-authored a chapter with Amanda Mattingly in The Guide to Corporate Crisis Management entitled, “Dealing with the Challenges of Political Violence and Crime in Latin America.” Published in January 2019 by Latin Lawyer, The Guide is designed to assist key corporate decision makers and their advisers in effectively planning for and managing corporate crises in the region. I hope you will find the chapter useful and share with your colleagues. If you or your firm would like an individualized consultation or information, please contact me at The Arkin Group. TAG President Jack Devine recently discussed the complicated situation in Venezuela, the struggle between the Venezuelan opposition leader Juan Guaidó and the Venezuelan government of Nicolás Maduro, and how the struggle has split the international community. Jack noted that Venezuela could be seen as another proxy war between the United States and Russia, commenting, “When I look at Venezuela today with my background having spent so many years in the struggle with the Russians and the Cubans, I mean, this is a very familiar pattern …” BizNews Radio in London picked up Jack’s comments originally recorded for Bloomberg Radio. Cold War Games in Venezuela? While in Ukraine, TAG President Jack Devine sat for an interview on Ukrainian national television to discuss important issues about national security threats and global challenges facing both the United States and Europe. As part of TAG President Jack Devine’s trip to Kiev, Ukraine, he was bestowed with the Order of St. Andrew by Patriarch Filaret of the Ukrainian Orthodox Church. The cleric thanked Jack for the U.S. support for Ukraine’s independence and a unified Ukrainian Orthodox Church. His Holiness Patriarch of Kyiv and All Russia-Ukraine Filaret met with former deputy director of the CIA Jack Devine. During the meeting, Jack Devine expressed his sincere enthusiasm for the level of support among Ukrainians for the idea of getting Tomas for autocephaly of the Ukrainian Orthodox Church. He also emphasized the prominent role of the Patriarch of Kyiv Filaret in his almost thirty-year historical struggle for the creation of an independent Local Ukrainian Orthodox Church from Russia and thanked for protecting the rights of Christians to atheistic Soviet authorities. 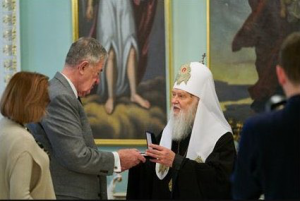 In his turn, Patriarch Filaret thanked Jack Devine for helping Ukraine on the part of the United States in support of Ukraine’s independence and the creation of a Single Local Ukrainian Orthodox Church. At the suggestion of Bogdan Gubsky, Chairman of the Board of the Ukraine-XXI Century Foundation and Paul Yaroshenko, a member of the Foundation Council, the Primate of the Kyiv Patriarchate awarded Jack Devine with the Order of St. Andrew Pervozvannyi. Jack Devine, former chief of CIA’s worldwide operations, and founding partner and President of The Arkin Group, discusses the escalating crisis in Saudi Arabia. CIA veteran and TAG President Jack Devine is quoted in Christopher Woody’s article published in Business Insider on the CIA’s successful effort to drive the Soviets out of Afghanistan in the 1980s. Jack said, “The Stinger changed the course of the war.” Within two years of that first successful Stinger strike, Russian forces began to pull out of Afghanistan, completing their withdrawal in February 1989, almost 10 years after invading.